- Valencia Hospitality: This is on top of the pit garage, and gives you CCTV and a good view of the start grid and most of the track. If you want to have a beer while watching the racing, this is the best value option! 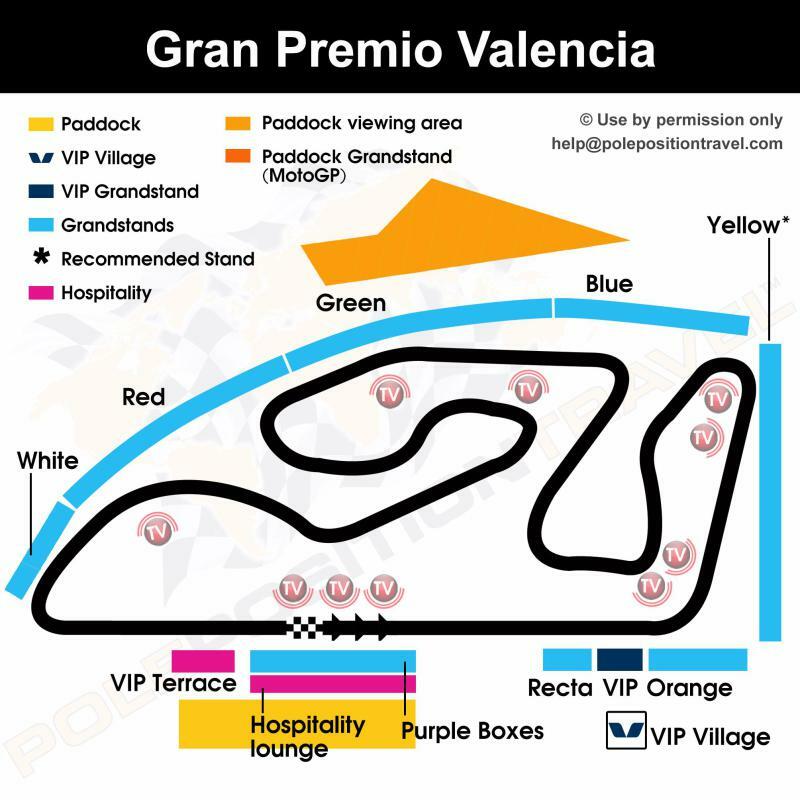 - Valencia MotoGP Grandstands; all with reserved seating, valid for all three days. Most seats have good views across the entire natural amphitheatre of the circuit, however only Yellow, Orange and Purple (above the pits) have TV views. Most of our Yellow seats are on the top overlooking turn 2 with panoramic views of the entire circuit. Orange is on the thrilling Turn 1; Purple are the most comfortable and give you great views of the start grid. Please note - alcohol is not permitted in the grandstands. TEAM EXPERIENCE: Our special Team Experience packages are available for this event. This sets you up as a guest of one of our sponsored MotoGP or Moto2 teams for a day or the weekend, with paddock access, pit visits, rider meetings, and more! Please enquire.